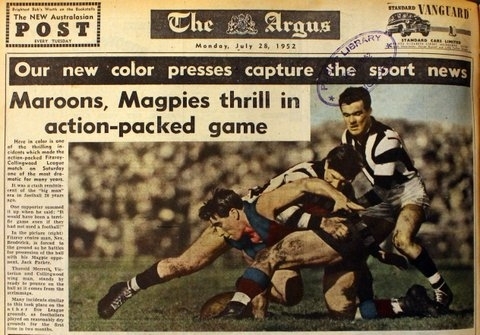 On Monday 28 July 1952, the Melbourne Argus became the first newspaper in the world to print a high-speed action news picture in full colour. 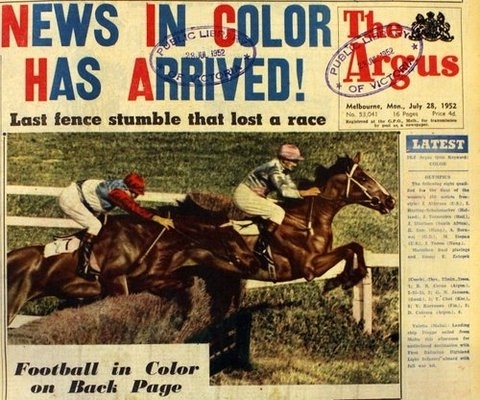 In what was a technological marvel for its time, there were coloured photos of sporting events on the front and back pages. The front page banner was printed in garish alternate blue and red block letters, which hopefully has never been repeated. This was accompanied by a photo of the AV Hiskens steeplechase at Moonee Valley the previous Saturday. The Argus did print in colour regularly, but their dream was short-lived as the newspaper closed in January 1957. Before then it was the envy of the newspaper world, especially when it published colour photos for the Olympics, the Melbourne Cup and the Queen’s visit in 1954. Circulation increased by up to 25% for issues covering these special events. However, former staff recall that the colour printers purchased by the paper’s new owners to rescue the struggling paper were unreliable and very expensive. Sometimes, printing problems resulted in The Argus missing all early morning sales as it was not distributed until after 9 or 10 am. It was not until the late 1980s that colour became a daily feature of newspapers, so The Argus was certainly well ahead of its time. I have a complete copy of the Herald published on Monday the 15th of October 1934 which I believe was the first newspaper in Australia to print a full colour front and back page. It depicts Batman entering the heads and commemorates Victoria’s 100 year anniversary. The newspaper is complete in very good condition and framed I am interested in selling this item if anyone is interested. Our Newspapers Librarian will be in touch soon – stay tuned. With the Herald front page being a colour illustration- rather than a photo- I think that was the difference the Argus was trying to claim. Do you have the copy of the Argus when Squizzy Taylor was murdered. I would like to see the front page. At the time Squizzy died, in 1927, most newspaper front pages contained advertising, instead of news headlines. Some papers, like The Age, included a short summary of the major news on the front page, but you had to open the paper for details. You can read more about Squizzy’s death in reports the day after his death, in Melbourne’s Argus newspaper (28 October 1927, page 15). This exciting account, in Sydney’s tabloid newspaper Truth (30 October 1927, page 13), is a great read too. I have tried for years to find the August 1952 front page . That is what my father remembers. They were at Cockatoo Vic. Please is you can help ,I will be so thankful and proud to print it and give to my father David Oliver. I will transfer your question across to our ‘Ask A Librarian’ service, and we email you with details about how to order a copy. Thanks you so very much Katie . Could someone advise me on how to track down an edition that carried a photograph taken of a young woman standing at a fruit stall in the city, probably Collins Street. Relatives remember the photo appearing on the front page of The Argus around the early days of the colour printing. They say that a photographer from the paper was taken with the young lady’s appearance, particularly the striking colour of her red hair. Thanks for your question Jules – one of our newspaper librarians will get back to you with some search tips.